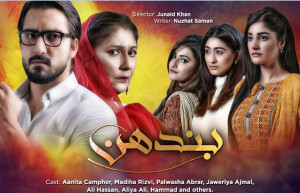 ARY Digital has continuously entertained their viewers throughout Ramadan and the week long special Eid transmissions and now they are bringing a whole new season of fresh dramas with the campaign name, Naye Kahaniyion Ki Barsaat. Let’s explore the new stories of life with ARY Digital starting from 11th July 2016 with Bandhan which is a story of a dominant single-parent mother, over-powering the emotions and decision of everyone else in the house with the cast, Aanita Camfer, Madiha Rizvi, Palwasha Abrar, Jaweriya Ajmal, Ali Hassan, Aliya Ali, Hammad and others. Commences from 11th July Monday to Thursday at 7:00 pm. Saheliyan, starting from 11th July Monday to Thursday at 7:30 pm is a story of three college going girls belonging to different classes but have one thing in common which are their dreams; staring Qavi Khan, Ismat Iqbal, Ayaz Samoo, Komal Aziz, Adila Khan, Sundus Tariq, Nazeed Raza, Maria Khan and others. In Naimat we will be seeing Sara and Babar’s story; they were a happily married couple once but unpredictability of life brings a reason for them to be apart. With cast Suneeta Marshal, Zahid Ahmed, Samina Ahmed, Kiran Haq, Semi Pasha, Shahood Alvi, Ismat Zaidi and others. The first episode of the drama will air on 11th July Monday at 8:00 pm. Tum Milay is a story of a girl Nimra who came from US to fulfill her father’s last wish of getting buried in Pakistan. Casting Affan Waheed, Sehr Afzal, Waseem Abbas, Maham Amir, Ali Abbas, Shamim Hilaly, Badar Khalil, Huma Nawab, Usman Pirzada, Seemi Pasha and others. The drama will also begin from 11th July Monday but at 9:00 pm. Mien Mehru Hoon is a story of a girl whose name is Mehru and is surviving with her present in the hope of her better future. She dreams of living a princess life after marriage. Sidra Batool is playing the character of Mehru; whereas Imran Aslam, Salma Hassan, Ahmed Hassan, Tipu Shareef, Nazia Malik, Zaheen Tahira, Shehzeen Rahat, Sundus Gulzar and others will be casting in the drama, starting from 11th July Monday to Thursday at 10:00 pm. Aap Kay Liye will start from 12th July Tuesday at 8:00 pm with Samina Perzada, Faysal Qurashi, Areej Fatima, Waseem Abbas, Salma Hasan, Saifi Hasan, Ghanna Ali, Asad Siddique and others. Teri Chah Main, a bold story starts from 13th July Wednesday at 8:00 pm staring Maria Wasti, Farhan Saeed, Salman Shahid, Saboor Ali, Faryal Mehmood, Shakeel, Ismat Iqbal, Asim Azhar and others.